Defining, shining and polishing wax. Illuminate, model and define your hair. 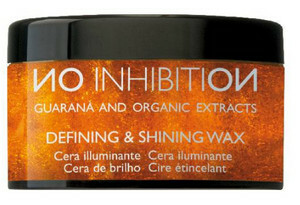 A shining, non fat and hydro soluble wax that protects your hair with filmogen agents and solar filters. With guarana & organic extracts. No inhibition defining and shining wax revitalizing with mix of fixing agents that hydrates and protects the hair. A water base emulsion with a waxy touch adds shine and protects from sun rays, thanks to its solar filters. Creates a sparkling look thanks to its natural mica particles. Apply to dry hair according to the desired style.